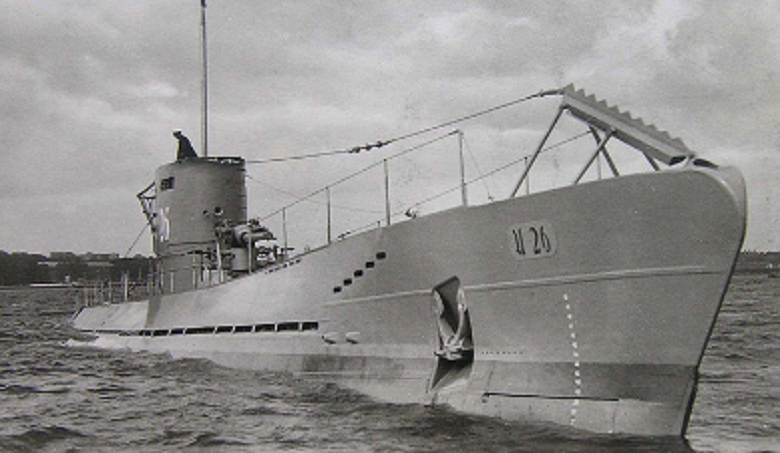 Just under 78 years ago, less than a year after the start of World War II, one of Germany’s submarines was tasked with patrolling the western approaches to the English Channel. The U-26 had been quite successful to date; it had sunk a number of ships, and had been the first one to enter the Mediterranean Sea. This was its sixth war patrol, but it was not going to have such a good result! On the 1st of July 1940 it was detected by a Royal Navy corvette and was damaged by depth charges. It was later caught on the surface and all 48 crew on board were taken prisoner. Being early in the war there were not many Prisoners Of War in the UK, and not many POW camps yet either. 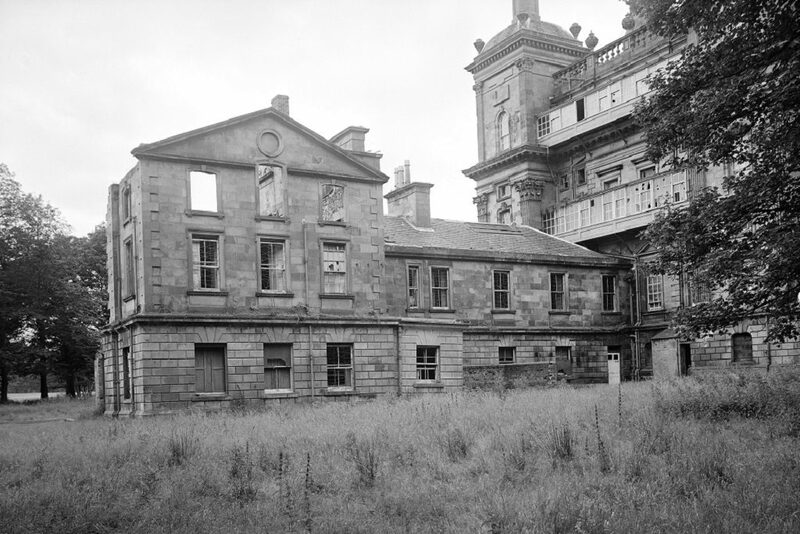 Duff House, a Georgian Mansion in Aberdeenshire, was designated Number 5. The U-26 crew were brought all the way from the south of Ireland to northeast Scotland. They were housed in the main building, guarded by soldiers from a number of different regiments, all enclosed within 8ft high barbed wire fences. One of the prisoners later described it as “A wonderful location”. They had not been there many days however when a unique event was to take place. On the morning of Monday 22 July 1940 a Heinkel 111 came out of the blue and, after circling the nearby town of Macduff, dropped four bombs on Duff House. Two of the bombs didn’t explode. Lucky for us, because one came down the Duff House stairwell. If it had detonated, perhaps we wouldn’t have the great building we have today. But two of the bombs hit the east wing of the House. Built in 1875 for extra bedrooms and kitchens, at this time it was used for the POWs. It was 9am and many of the men were outside exercising. However six German prisoners from the U-26 and two of the British guards were killed. Many more were injured. As one of the surviving Germans later commented, to have been saved from a sinking U-boat only to be bombed by your own side was an experience that didn’t inspire trust in the Luftwaffe! This event is believed to be the only German on German “friendly-fire” event in the UK throughout World War II – and it took place in an otherwise quiet small Scottish seaside town. 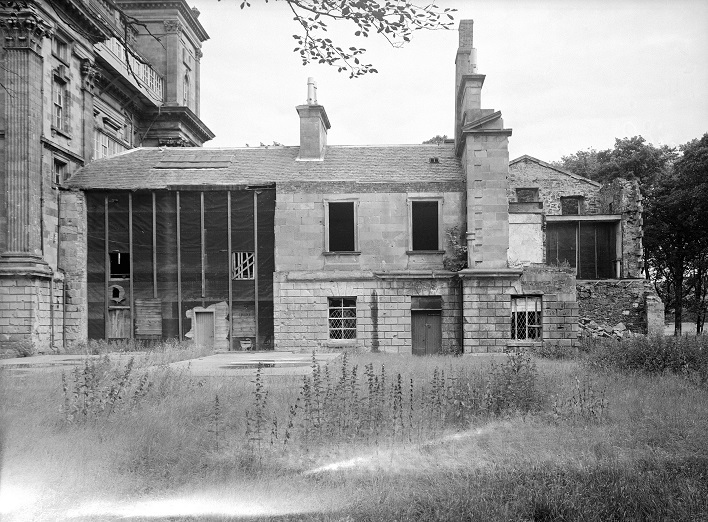 This was also the end of Duff House as a POW camp. The prisoners were moved elsewhere and spent the rest of their war in Canada, as was the practice of the British early in World War II. 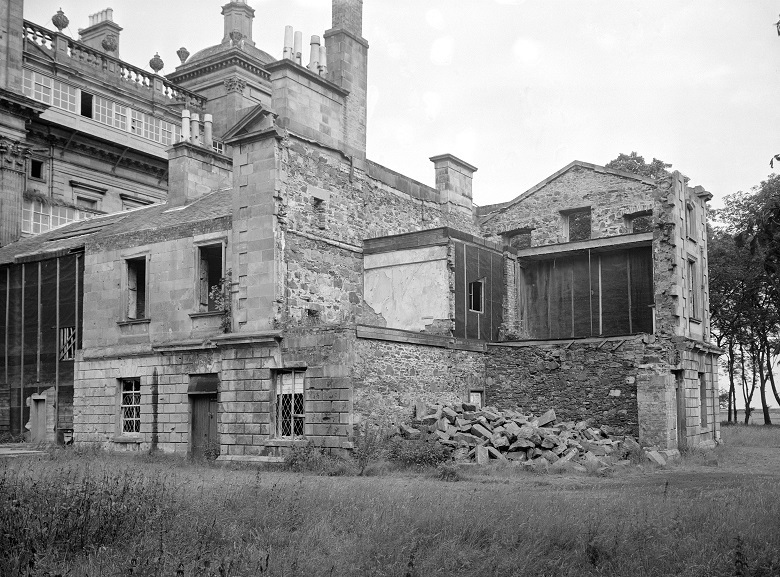 Fortunately the damage to Duff House, apart from some shrapnel marks, was limited to the east wing. This was later demolished. The House became a base for many regiments during the rest of the war, but then fell into disuse. A major renovation project was undertaken in the nineties and today the House is a spectacular Georgian mansion. The British dead from the bombing were buried in their home churchyards. The German dead were initially interred in Banff cemetery, but were later re-interred at the German War Cemetery at Cannock Chase. 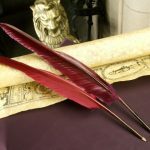 The research to date has identified the names of the dead and injured and various other facts; yet there are still plenty of questions to look at. Why were the prisoners in the main house, and the guards in the Nissen huts? Why is there no official file on POW Camp No5 – but there is on the other early camps? Why are no troops listed as being stationed in Banff in July 1940? Was the Heinkel just a reconnaissance plane that didn’t want to carry its bombs all the way home; or is there more to the story? We hope to find out the answers some day. On Sunday 22 July 2018, the Friends of Duff House dedicated a memorial to the eight people that died, and to all those injured at the House in 1940. The day also saw the launch of Out of The Blue, a book with all the details of the known story. Thanks to Ian Williams, Jim Mackay and the Friends of Duff House for this post. The Friends of Duff House started in 1998 and does pretty much what it “says on the tin”. With the aim of advancing interest in Duff House and its estate, Friends hold a number of events throughout the year, and undertake projects to improve knowledge and development.